Windows Chess is a game information page. It is categorized as: Orthodox chess, . Windows Chess . Windows Chess is played on a board inspired by an arch window in my neighbourhood. By David Cannon. This designer is intent on specializing in unsusual boards: http://www.chessvariants.org/index/msdisplay.php?itemid=MSmatrixchess, http://www.chessvariants.org/index/msdisplay.php?itemid=MSchessonasoccer, http://www.chessvariants.org/index/msdisplay.php?itemid=MSroundhoneycomb. Thanks for the idea, Daniil! 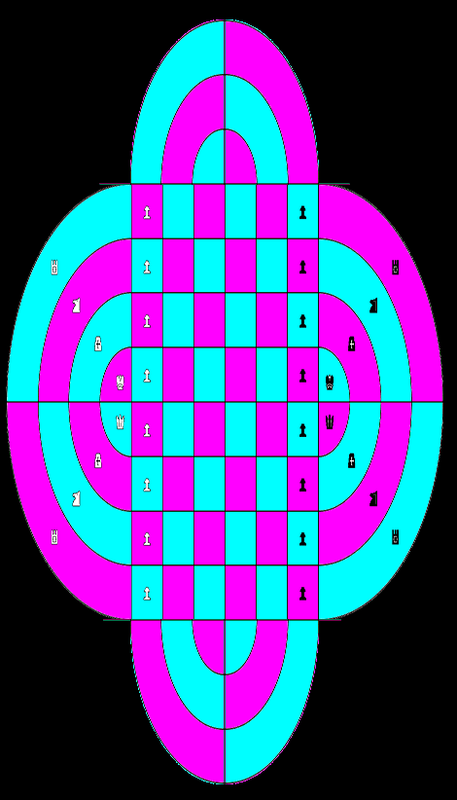 If board will be extended, this shape can be used to make four-player game. Note to editors: I'm more or less finished now. I don't know how to link it to the zillions file under the "See also" heading, so I'd be grateful if you'd do that fore me. Thanks! I'm not finished yet. I have a few more images to upload and some polishing to do before the game is ready for publication, so I would respectfully ask the editors to postpone publication until I've finished (in 24-48 hours or so). Thanks!